"Add 10"" Sod Cloth? (add $50)"
A Carousel-style pavilion designed for use with perimeter poles instead of the spoke-wheel design. 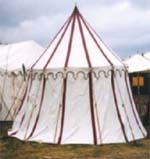 This is basically a round marquee tent with reinforced brass grommets at the pole positions. Slanted walls are standard. Walls are made as two separate, detachable curtain pieces with snaps and D-rings. Poles, ropes, and stakes are sold separately for this pavilion in the "Set-Up Package."